It was about two weeks ago that we first learned six actresses were in contention for the lead female role in director Tim Miller's Deadpool movie, but now apparently the filmmakers and folks at 20th Century Fox have made their selection from that list. New reports have revealed that it will be Morena Baccarin, best known for her roles on the television series Firefly and Homeland, who will be sharing scenes with Ryan Reynolds in the 2016 comic book movie. It's The Hollywood Reporter that has the scoop on Baccarin's addition to the Deadpool cast - though sadly the trade doesn't seem to have any solid information about the role that she will be playing. Instead, the only detail provided is that she will wind up being a romantic interest for the titular mouthy mercenary. The actress joins a cast that also includes Silicon Valley star T.J. Miller (who it seems will be playing Deadpool's sidekick, Weasel) and Gina Carano (who signed on to the movie last week to play the adrenaline-controlling mutant Angel Dust). We've also heard that Game of Thrones' Ed Skrein may be in the movie as well, said to be playing the villain. Attractive and worldly. Smart, tough, beautiful but a little bit broken. Nothing has ever been easy for her and she’s developed a thick skin and cynical outlook. But she’s not a victim—she may not have a great life but she’s holding it together and does what she needs to get by. She’s got a great sense of humor but it leans heavily towards irony and sarcasm. My initial guess was that this was a description of Domino - a mutant who was born in a government breeding program, and, like Deadpool, works as a mercenary - but another possibility (as one of our readers pointed out) is that she could be Copycat, a shapeshifting mutant who was a prostitute and Deadpool's girlfriend before the horrific medical experiments that turned him into Deadpool. 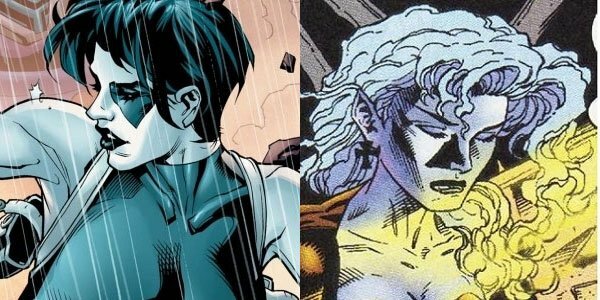 You can see both Domino and Copycat in images below, with the former on the left and the latter on the right. Deadpool is now less than a year away, with 20th Century Fox having set the film for a February 12, 2016 release date. We will surely be hearing many more casting updates soon, so stay tuned! In the meantime, you can get a preview of Morena Baccarin going on comic book adventures weekly, as she has been a featured player recently on Gotham.